1. Preheat oven to 350°F. Grease and flour insides of 12 muffin cups, or insert paper liners. 2. 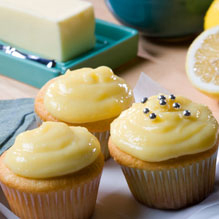 With an electric mixer on medium speed, beat together butter, sugar and citrus zests until smooth. 3. In a separate bowl, sift together flour, baking powder and salt. 4. 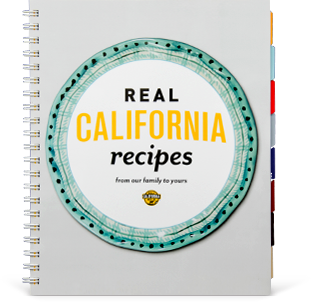 In a small bowl, stir together Real California Milk, lemon juice and vanilla extract. Mixture will curdle slightly. 5. With an electric mixer on low speed, alternately add dry ingredients and milk to butter mixture in 3 additions, stirring well after each addition. On medium speed, add eggs one at a time, mixing well after each addition. Beat for 1 minute. 6. Evenly divide the batter between cupcake molds. Bake until a toothpick inserted in the middle comes out clean, about 20 minutes. Cool for 15 minutes. Remove cupcakes from pans. Cool completely before frosting. 1. Whisk together egg yolks, eggs and sugar. Whisk in lemon juice. Cook in a double boiler or on stovetop over low heat, stirring constantly until thickened, about 5 minutes. 2. Transfer lemon mixture to a bowl. Cool for 5 minutes, stirring occasionally. Stir in butter. Cover mixture with plastic wrap and refrigerate until cold and firm, 30 minutes to 1 hour. 3. Frost cupcakes. Sprinkle silver cake beads on each cupcake.